The Floating Empire: Dealing with Cold, the final. . .for now. So, yesterday, after a week of beautiful weather, we mostly completed closing in our cockpit/wheelhouse. The effects have been immediate. Last evening we were able to sit in the cockpit in our shirtsleeves comfortably with no other heat on (outside temperatures were hovering around 50F at the time.) In the mornings, the moment the sun is up, our new floating greenhouse begins to warm and by mid morning the place is quite comfortable. We don't have hard temperature data yet but I'll be supplying that shortly. This stuff is so damn clear it's hard to take a picture of it. You can see the substantial size o our winter greenhouse, though. 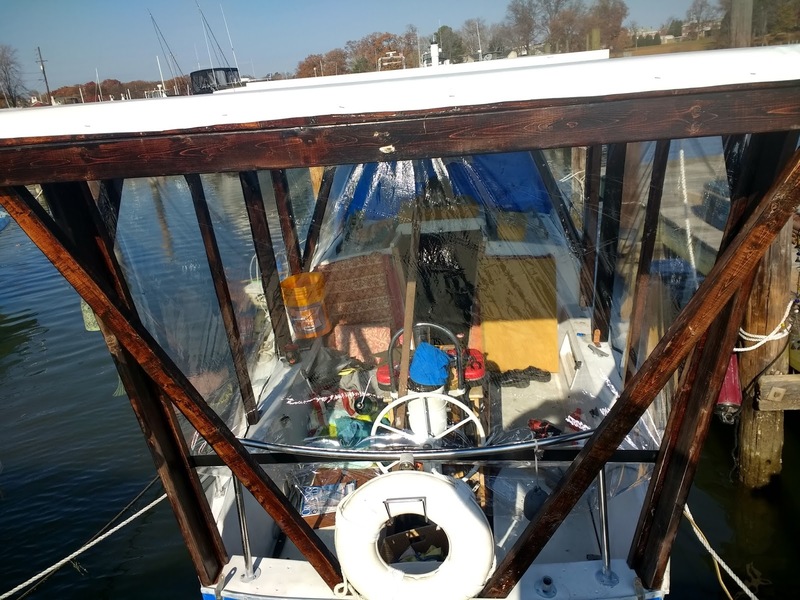 To recap: we decided to enclose the wheelhouse in a product called flexoglass from a company called Warp Bros in Chicago, Il (we purchased ours through Amazon here). The product is a tough, amazingly clear vinyl glazing sold in 25 yd. by 48" rolls (other sizes are available) and used primarily for enclosing screen porches and greenhouses. It is a great deal cheaper than the "eisenglas" typically sold for boat enclosures. We chose the 4mil variety (It also comes in a stout 10mil). The roll we bought cost us a bit over $80, and was enough to do the entire boat. 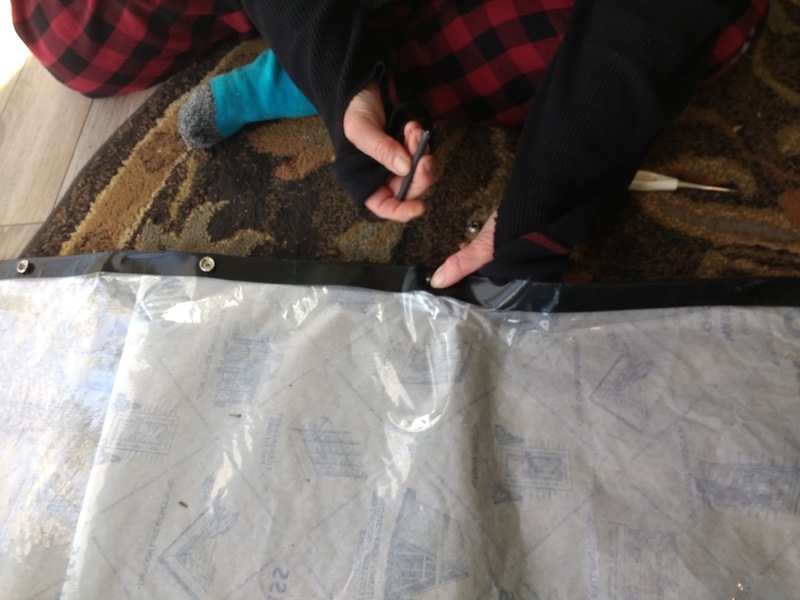 After measuring and in some cases creating a paper template to match irregular openings, we laid out and cut the material (scissors work just fine)and reinforced the edges of the material by folding 2" of Gorilla Tape over the edge. We finally figured out that the best way to do this was to lay out the Gorilla Tape sticky side up, held in place on either end by a bit of blue painter's tape (which is easy to remove). 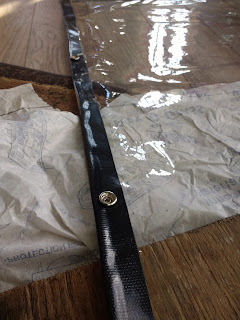 Then we stretched out the Flexoglass and stuck it down halfway across the tape, then folded the edge over. Please note, the Gorilla Tape is VERY FREAKING STICKY. It will stick to anything: itself, the floor, you, your clothing, the cat. . . .and once it does stick, you aren't pulling it loose, PERIOD. This makes sticking the tape to the edges a matter to be undertaken with some care. 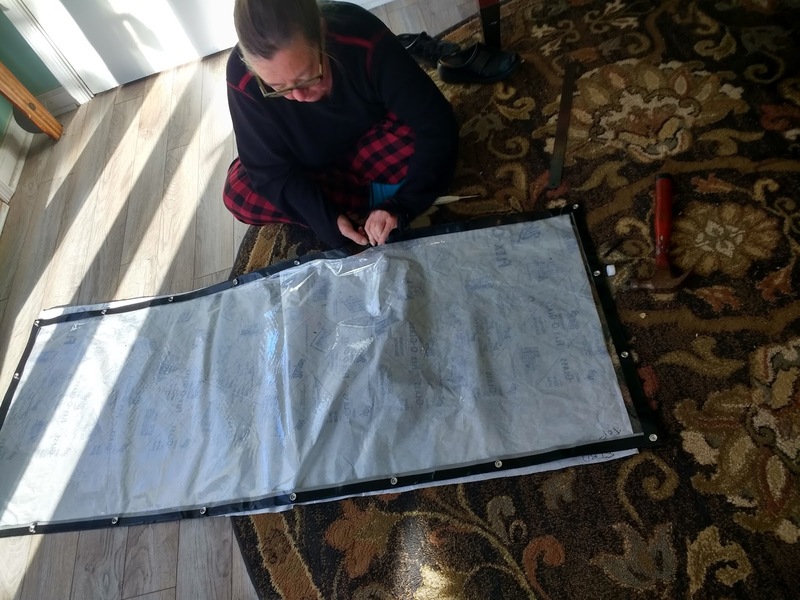 We might opt for something simpler, but we used the same technique in creating screens for our hatches, and were impressed by the strength of it (including supporting our 17 pound boat cat who loves to sleep on top of the hatch screen). We then set screw snaps around the Gorilla Tape edging. While most of the big box stores have screw snap kits, with the stuff to set them, they usually only include about 6 snaps, so after we had the kit, we went on the web and ordered a larger amount of the snaps themselves. Trust me, you're gonna use twice as many of these as you think you are. Places we didn't intend to open, we used small stainless screws and washers instead as a cheaper, faster alternative. Most of the big box hardware stores carry these, but once you have the setting tools, it's much better to buy the snaps in bulk. The paper backing is rolled up with the Flexoglass and not only helps keep it clean and unscratched, it also helps you SEE the damn stuff. No way around it, setting the snaps is tedious. 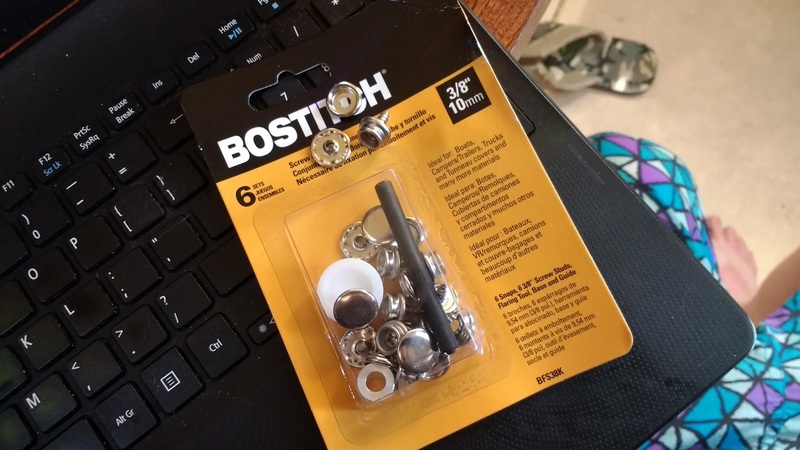 There are pliers designed for this, but they're REALLY pricey, so unless you're setting hundreds of snaps, you're likely stuck with a hammer and this stuff. If you're careful, though, the look is pretty clean. Attaching the male part of the screw snaps is a matter of holding the glazing in place to make sure where the snaps fall and screwing them in place. There is VERY little wiggle room here, if you want the stuff to lay flat. The next time we do this I might consider edging the glazing and screwing it in place with screws and washers, then removing it and using those holes for the snaps, both on the glazing and on the boat. Yes, that would probably work pretty well. Duh. About 3/4 way through the install, we had a night of VERY high winds, gusts in the 50mph range. We got knocked around pretty good, but if I had any doubts about the strength of 4mil Flexoglass, they were assuaged that night. No damage, nothing pulled through, nothing even came unsnapped. Lesson learned. We're not fully finished yet. The front is probably going to be rigid lexan, and right now it's enclosed with a blue tarp, and there are still some gaps around the top of the Flexoglass for which we still have to fabricate a fill, but the enclosure has already made a huge difference. I can see that we'll be able to use the cockpit as another living space through most of the winter, and that pleases me. 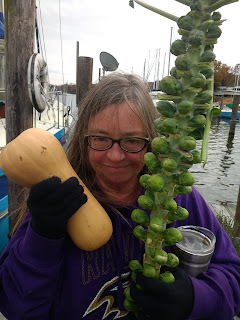 As I sit here at the laptop, it's 42F outside and we're both sitting here in our stocking feet with the main companionway open to the wheelhouse and the heat off. Interior temperature is a bit over 60F. Actually it's warmer in the cockpit. Not a sauna, but I'll take it. It's been a beautiful, mild late fall here. Some days have hit the 60's and we've not had really any terrible weather of late, which has let us get a lot of things done that might otherwise have been miserable and problematic. 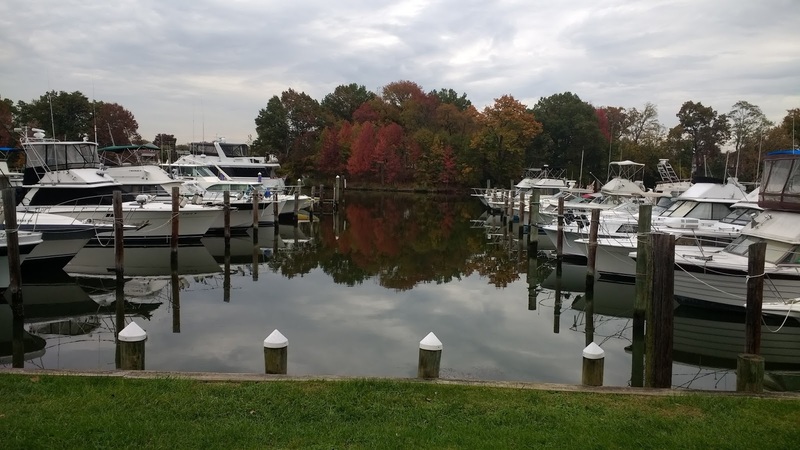 The boats are coming out of the Marina and being stored up on the hard apace, and very soon, it will just be about 20 livaboards afloat here on the middle river. Within a few weeks, the lovely water will still be here, the boats will not. Also our favorite local farm Zahradka's has been cranking out some truly amazing local, sustainable produce. So all in all it's shaping up to be a warm and yummy early Winter. More shortly. what a great improvement to being a livaboard. now you have a nice enclosed warm porch to observe life instead of being stuck down below.when I spent a lot of time on my 27 catalina I would dream of having an enclosed cockpit or even wheel house as on motor sailers. Im betting its gonna make your over winter life much more enjoyable. I m currently watching the snow-precip fall upon my windshield from my "livingroom " in my Roadtrek camper van.